Aviation Industry Corporation of China (AVIC), China's top aircraft manufacturer, announced cooperation plans with Safran and GE yesterday, aimed chiefly at boosting the country's homemade jumbo jet program. The C919, China's largest domestically manufactured jetliner that is expected to take off in 2016, will source parts and components globally, but foreign suppliers are encouraged to enter into partnerships with Chinese manufacturers, Wu Guanghui, chief designer and deputy general manager of the Shanghai-based Commercial Aviation Corporation (COMAC), which is producing the jet, said yesterday. 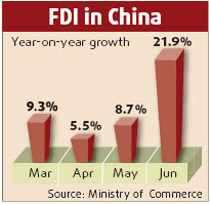 "Priority will go to products designed and manufactured by foreign suppliers and their partners in China," he said. AVIC and France-based Safran Group yesterday signed a framework agreement during the ongoing Aviation Expo China 2009 in Beijing to extend their partnership. The expo started yesterday and ends Saturday. The agreement includes establishing new facilities in China based on both sides' existing assets, and cooperating on all aspects of a production line, from design, production, assembly, to support. The short-term targets focus on producing landing and braking systems and nacelles (engine compartment) for the C919, according to a news release by Safran. The subsidiaries of Safran and AVIC will together submit a joint proposal to COMAC for landing and braking systems on the C919, it said. Meanwhile, AVIC, GE and Safran signed a memorandum of understanding (MOU) yesterday on setting up a joint venture that designs and manufactures engine nacelles and components for a full range of aircraft applications including the home-made jumbo jet C919. The new joint venture is between AVIC Aircraft Corporation and Nexcelle - a nacelle joint venture company created by GE's Middle River Aircraft Systems and Aircelle, a Safran group company. 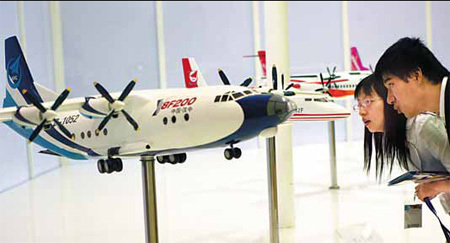 AVIC Aircraft and Nexcelle will have equal stakes in the venture. Both the dollar value and the location of the undertaking have not been disclosed. Lorraine Bolsinger, president and CEO of GE Aviation Systems, told China Daily that the first target of the new joint venture would be the C919 project. In the long run, "we plan to have the joint venture as a worldwide supplier to pursue new platforms to go beyond C919," she said. The engine nacelle technology is one of the fundamental elements in an aircraft's performance, efficiency and environmental footprint. Foreign aviation suppliers are competing for business opportunities arising from China's plans to build a jumbo jet. According to the COMAC website reports, a number of major global aviation suppliers have paid intensive visits to COMAC, after the latter issued the invitation for tender on July 10 for engines and airborne equipment to be used on the C919. Last month, Goodrich Corporation and Xi'an Aircraft International Corporation (XAIC) under AVIC also signed agreements to form two joint-venture companies that will be involved in the manufacture of landing gear and nacelle components, in order to participate in the C919 project.